French philosopher; flourished in the twelfth and thirteenth centuries. He defended Maimonides against the severe attacks of Abraham ben David of Posquières (RABaD), and at Jonathan's instance Maimonides sent to Lunel his "Moreh Nebukim," which Samuel ibn Tibbon translated into Hebrew. Jonathan is the author of a commentary on a work by Alfasi. 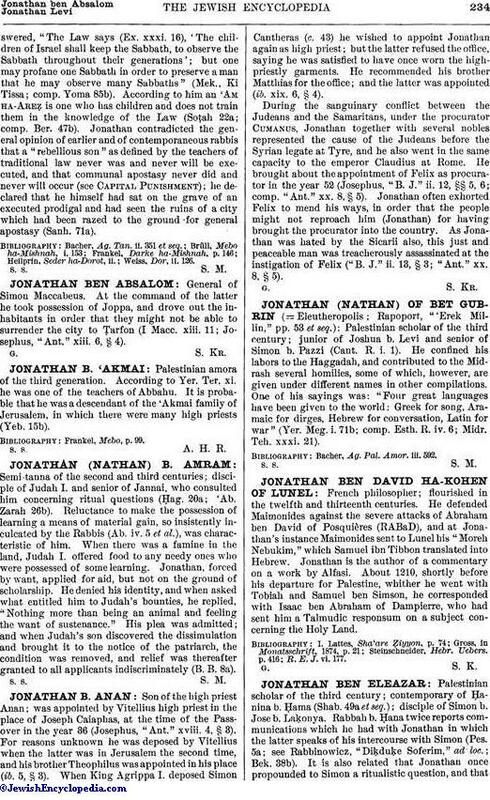 About 1210, shortly before his departure for Palestine, whither he went with Tobiah and Samuel ben Simson, he corresponded with Isaac ben Abraham of Dampierre, who had sent him a Talmudic responsum on a subject concerning the Holy Land. R. E. J. vi. 177.